Right to Education is one of the fundamental rights of every Indian citizen. Sharda University believes that money should not be a road block for a student with innovative ideas in his mind and passion in his heart. We extend scholarships and financial assistance to meritorious students based on their academic achievements. A number of scholarships are offered to students depending on the academic credentials and their achievements in sporting and cultural arena. The University grants full to partial waiver on tuition fees payable by the student. PG Programme: M.Tech., M.Sc., Master of Physiotherapy, M.A., MCA & M.Design. The students who have excelled in sporting activities at National & State Level will be eligible for Sports Scholarship from 10% to 80% on tuition fee in the 1st year. For updated & detailed information on the nature of Sports and the Eligibility criteria, you may visit the University campus or drop us an e-mail at admissions@sharda.ac.in. Scholarship of 5% to their wards on tuition fee of 1st year in all courses except Medical, Dental, Nursing & Pharmacy. Fee waiver of 5% in 1st year for student whose sibling is pursuing education at the university. Proof of relation is required. Maximum one Scholarship can be availed by the students whichever is higher. On conclusion of Admission 2019-20, the number of scholarships granted and the names of beneficiaries will be placed on University website. The number of scholarships in 2nd and subsequent years shall be equivalent to the number of scholarships granted in 1st year. For continuation of scholarship, minimum 8.00 CGPA required for eligibility. Scholarship would not apply if there is gap between academic sessions. Only those students who have cleared their examination in 2018-19 would be eligible for scholarship. In B.Sc. Nursing & B.Pharma- 5% Seats are under Scholarship Scheme. 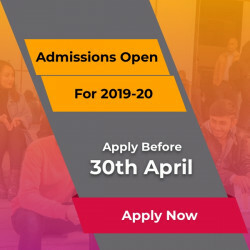 Last date to avail scholarship is 30th June 19.